Are you reading this page because you are thinking of trying this sport? Or have you (as a non-endurance rider) been reading all the controversy on the Social Media sites regarding this sport? Please take the time to read this rather lengthy, but extremely informative, blog post about how Endurance got started and what’s happening today in this sport. The Rebirth Of Endurance. Then PLEASE read Patty’s blog, I could not have said it any better. Then call me and come out and do some conditioning rides with me. Ride along on your horse, or mine. If your body stays intact, you will get as addicted to this sport as I am!!! Still not convinced, then read about the TOP 10 REASONS NOT TO JOIN … Maybe that will change your mind. Here’s some fun facts from other riders … published in the AERC Spring Quarterly. And check out my annual schedule of planned events. Due to my back injury, I am only riding ONE RIDE AT A TIME, so this listing is simply a “bucket list”. And at each ride, I am simply riding one loop at a time. I look down the trail and have as much fun as possible. I am not being competitive (anymore) to win anything, I am only looking to finish. What could be more exciting than riding a horse a 100 miles in one day. The thrill of getting dirty, tired, sleepy, sweaty, and finding out that a tree to hide behind when you need to “go” … Yes, this is the most fun I ever have, riding endurance. I am done being a baby about my busted up back and I’m putting myself back in the competitive world in 2014. MY GOAL? To Finish! Stay tuned for stories. I posted this picture here to remind me what fun I used to have. 2008 was the last year I competed the entire season. I posted this one to remind me of all the fun I had during 2014 – my first year back after my accident in 2010. I am a member of AERC (American Endurance Ride Conference – www.aerc.org) and also a listed mentor for the sport. 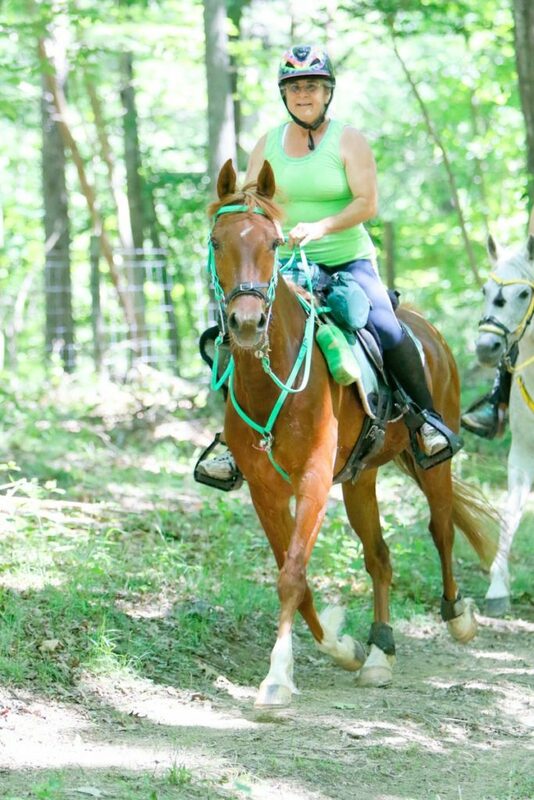 I am also a member of ECTRA (Eastern Competitive Trail Ride Association – www.ectra.org) and I compete on a small Arabian mare named Miss Daizy (she is featured in the banner of this webpage). In five or six years from now (2019) you may see me competing on an Arabian that I bred myself…but for now, be content with following Miss Daizy’s career. She has her own Facebook page, I invite you to come and join the group Arabian – Miss Daizy & Steel. These are my two horses that compete. Endurance is a highly addictive sport and I recommend that anyone wanting to get involved start out a crew for an Endurance rider. Find out what happens on the ground first. This may scare you off the sport forever (grin). Once you have successfully crewed for an endurance rider (this means that you did not get yelled at, stuff thrown at you or looks that can kill) it is time for you to find your own way onto the trail. many mentors have different approaches to conditioning a horse. They have developed this tried and true methods based on their own personal experiences. PLEASE! If you choose a mentor, and you trust that mentor, follow their instructions – forget what everyone else is telling you – and you’ll be on your way to competing successfully. I firmly believe that any horse that is sound in body and mind, healthy, conditioned properly and has the right attitude of going down trail looking two miles ahead, can successfully compete endurance … regardless of breed, gender or age. Our sport does not allow a horse under 60 months to compete, so I always recommend choosing a horse 8 to 10 years old to start. Now, for those of you following my career over the years, you will know that my first endurance horse was 16 years old and had never been exposed to endurance before I found it. He was exceptional and I firmly believe there are other exceptional horses out there, but I don’t recommend looking for a 16 year old! My new ride in 2017, Radiant Roulette aka Penny Pony. I am having the best season of my life riding this mare. Read the stories. I encourage anyone who loves to trail ride, and loves to go fast, and doesn’t mind being tired and dirty, to try this sport (at least once). You may find yourself an addict like me! Endurance is 50 miles or more in one day. Limited Distance is under 50 miles in one day. Competitive Trail Rides have a different set of rules than endurance and can be as short as 25 miles and as long as 100 miles over several days. Some articles I enjoyed reading (or writing). 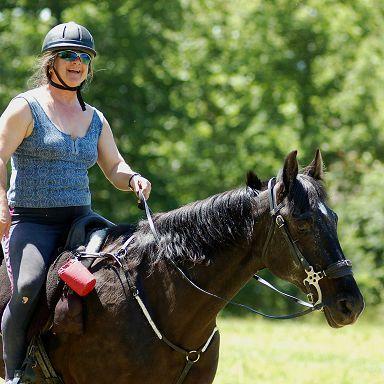 Can my Tennessee Walker do endurance? Patty’s blog that inspired me to get on my horse and do 100 miles.